Keiser K. ESIP User-Community Readiness Rankings: Augmented Metadata for Data Products Based on Specific User-Community Criteria. ESIP Winter Meeting. 2018 . Graves SJ. Data Preparedness for Disasters, Hazards and Other Events Nair U, Ebersole S, Keiser K, McEniry M, Beck JM. ESIP Winter Meeting. 2017 . Beck J. Disaster Event-Based Data Collections with ArcGIS Online Data Processing Keiser K. Esri Annual User's Conference. 2017 . Graves S. ECITE and Beyond Keiser K, Law E, Yang C, Djorgovski G, Mahabal A. NSF EarthCube All Hands Meeting. 2017 . Beck J. Event-Driven Virtual Collections for Community Solutions Conovor H, Keiser K. ESIP Winter Meeting, Washington, D.C. 2017 . Ebersole S. Integrated Geospatial Distribution Systems for Disaster Event Data Keiser K. Geological Society of America Southeastern Conference. 2017 . Graves S. Science-Driven Workbench Keiser K. NSF EarthCube All Hands Meeting. 2017 . Keiser K, Kulkarni A, Caron B. Science on Drupal, Applications for Science Data Systems. ESIP 2015 Winter Meeting. 2015 . 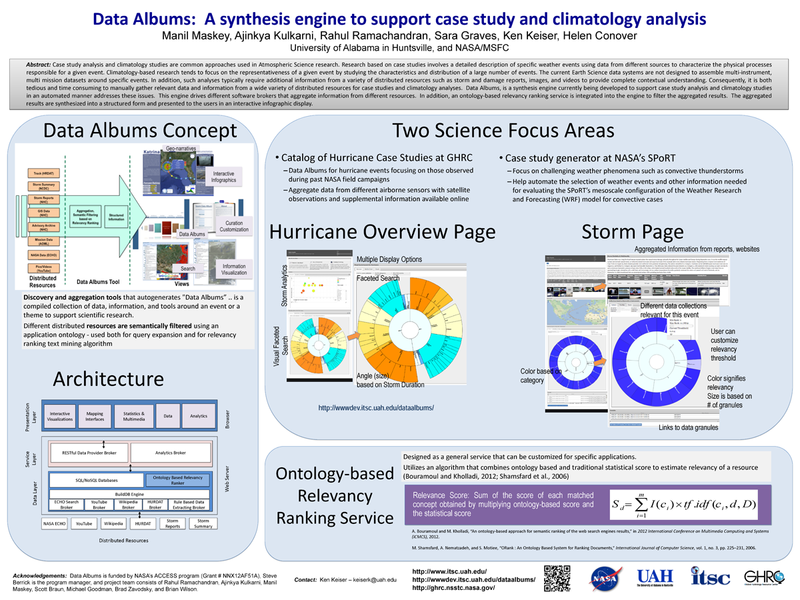 Kulkarni A, Keiser K. Data Albums: A search and discovery tool to support case study and climatology analysis. ESDIS Webinar Series. 2014 . 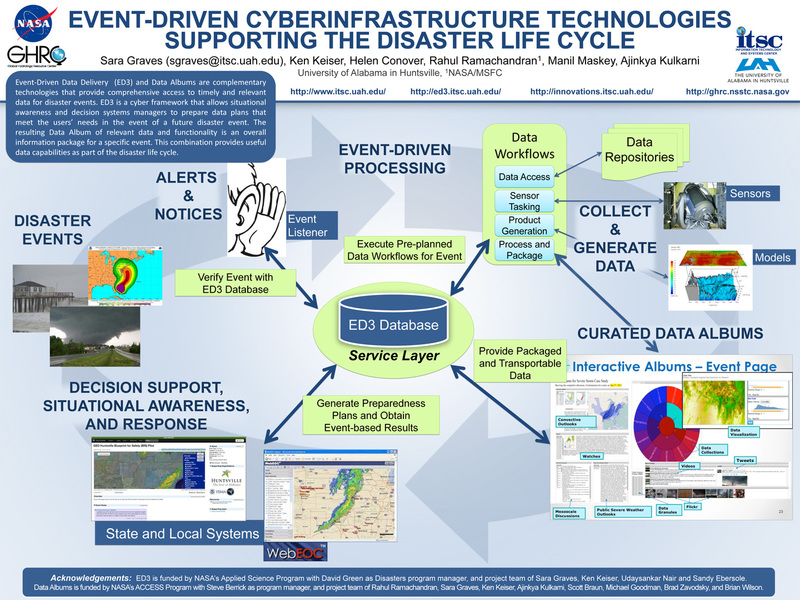 Keiser K. Data Preparedness for Disasters at Local Governments. In: Geo Huntsville - Local Government Usersgroup. Geo Huntsville - Local Government Usersgroup. Huntsville, AL: Geo Huntsville; 2014. Graves S, Keiser K. Event-based Technologies. GeoHSV/GeoInt TechVet2. 2014 . Smith DK, Li X, Keiser K, Flynn S. Regional Air-Sea Interactions (RASI) Climatology for Central America Coastal Gap Wind and Upwelling Events. Oceans 2014 MTS/IEEE Conference. 2014 . 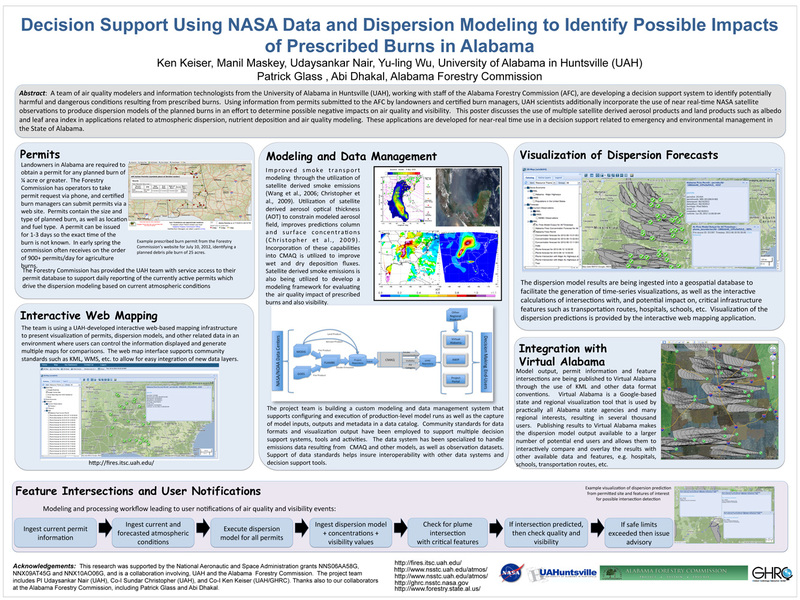 Flynn S, Li X, Smith DK, Keiser K. When Mountains Blow..A Joint Venture Between DISCOVER, NASA's Global Hydrology Resource Center, and UAH's Information Technology and Systems Center. UAH Week of Welcome. 2013 . Li X, Smith DK, Keiser K. Automated Detection of Gap Wind and Ocean Upwelling Events in Central American Gulf Regions. 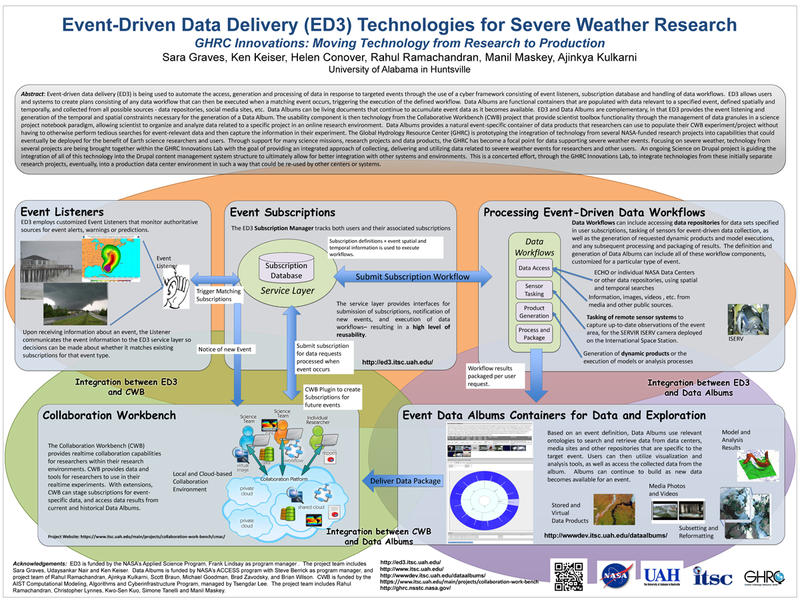 In: 92nd American Meteorological Society Annual Meeting. 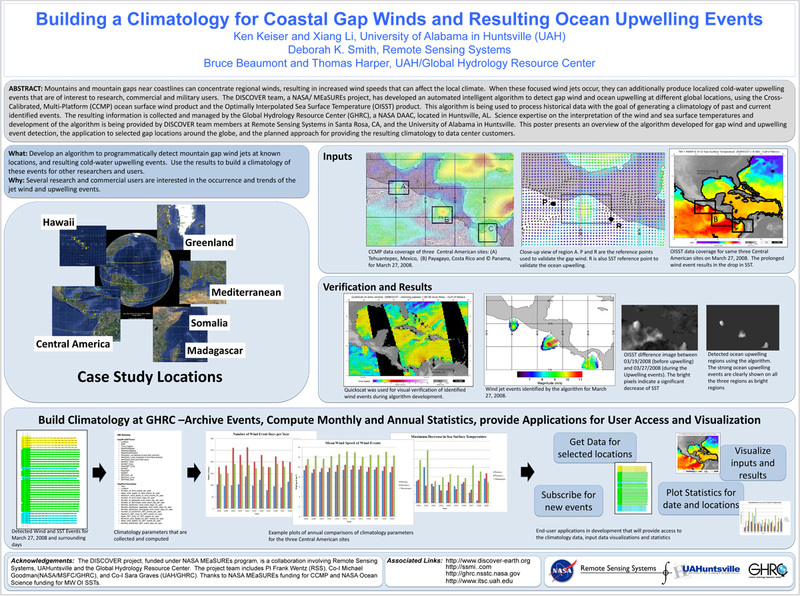 92nd American Meteorological Society Annual Meeting. New Orleans, LA; 2012. Graves SJ, Li X, Keiser K, Smith DK. 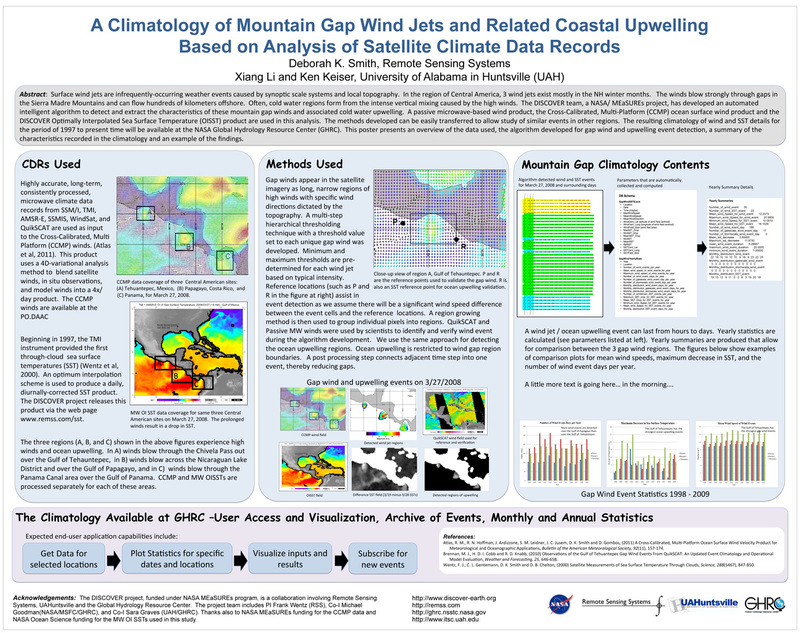 Building a Climatology for Mountain Gap Wind Jets and Related Coastal Upwelling. In: Super Computer 2012 Climate Knowledge Discovery Workshop. Super Computer 2012 Climate Knowledge Discovery Workshop. ; 2012.